The battle of Actium ended the Second Triumvirate and shifted the power base of Roman rule of the Mediterranean to the West. Octavian’s subjugation and incorporation of Egypt as a direct result of the battle expanded the eastern frontiers of the empire and helped inaugurate his role as Augustus, the first leader of an empire that would last for five hundred years. For these reasons, military and political historians view Actium as decisive with far-reaching consequences. The relationship between Octavian and Mark Antony, members of the Second Triumvirate, dated to the civil war and the aftermath associated with the assassination of Julius Caesar. Antony, however, divorced Octavian’s sister, Octavia, shortly before the battle, aligning himself politically and romantically with Egypt’s last queen, Cleopatra VII. Cleopatra had been similarly entangled with Caesar, using her charms to preserve the integrity of Egypt in a Mediterranean world increasingly dominated by Rome. After Antony’s divorce from Octavia, Octavian published Antony’s will which favored his offspring with Cleopatra VII, the fruits of Caesar’s affair with the Egyptian queen. Following the publication of the terms of Antony’s will, the Roman people were outraged and the Senate ordered Octavian to attack Cleopatra. Cleopatra was in western Greece with Mark Antony, their combined fleets of lumbering vessels waiting to sail into the Ionian Sea. Octavian’s army of 40,000 men, encamped north of Antony’s army, waited for the proper moment to attack. Octavian’s navy was outnumbered but contained Liburnians, lighter vessels featuring only two banks of oars. These ships were far more maneuverable. At dawn on September 2, 31 B.C.E., Antony’s naval force sailed into the Ionian Sea. The battle lasted over ten hours and proved to be a decisive Roman victory. During the midst of the encounter, Cleopatra’s fleet, which had taken position in the rear, sailed into the open sea headed for Alexandria. Antony, realizing Cleopatra was fleeing, left the battle to pursue her. Without his leadership, his fleet was destroyed. Actium also saw the use of fire ships and incendiary missiles. Octavian returned to Rome in order to mount a campaign against Egypt. Although Antony utilized a sizeable defensive force to stop any Roman invasion, it was to no avail as most of his men deserted once Octavian landed. Antony committed suicide and was followed soon after by Cleopatra and her infant son born to Julius Caesar. In a final effort, Cleopatra attempted to seduce Octavian but he was immune to her charms. The manner of her death is still a matter of scholarly discussion and debate. Egypt was incorporated into Rome, ruled by an imperial governor appointed by Octavian. The province’s wealth greatly enhanced Roman fortunes: one third of Rome’s grain consumption was tied to grain production in the Nile River delta. Additionally, Egypt was a vital trade crossroad between the Mediterranean world and the vast riches of the east, chiefly carried to Egypt along the Red Sea. 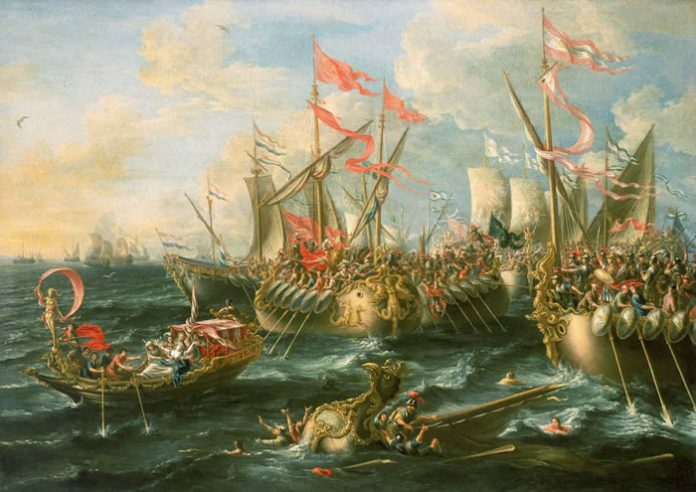 Historian Lynn Montross refers to Actium as, “The most decisive sea engagement of the ancient world.” Actium solidified the leadership position of Octavian and ensured that the subsequent empire would take its cue from the West. The battle ended Egyptian sovereignty and expanded Roman hegemony over the East, incorporating a wealthy new frontier province. The long-term affects of Actium impacted various areas of Roman political, economic, and ultimately religious control.